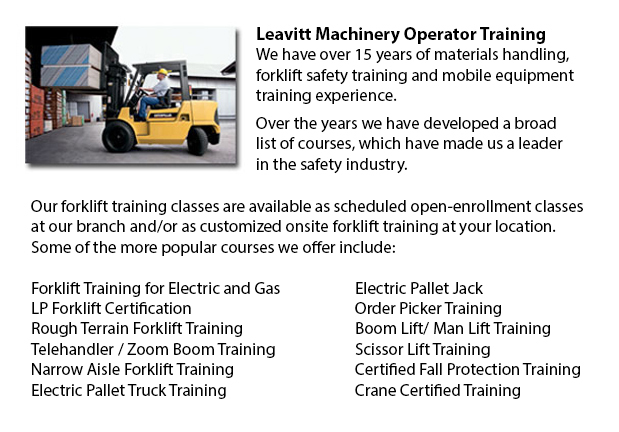 Forklift Training Course Grande Prairie - Federal and industry regulators have established the criteria for forklift safety training based on their current regulations and standards. Individuals wishing to use a forklift should finish a forklift training course before using one of these machines. The accredited Forklift Operator Training Program is designed to offer trainees with the practical skills and information to become an operator of a forklift. Mobile Equipment and Vehicle safety regulations which apply to forklift operation include pre-shift inspections, and rules for lifting and loading. An inspection checklist must be done and given to the supervising authority prior to starting a shift. When a maintenance problem is uncovered, the utilization of the specific machine should be stopped until the issue has been dealt with. To be able to indicate the equipment is out of service, the keys should be removed from the ignition and a warning tag placed in a visible spot. Safety rules for loading will include checking the forklift's load rating capacity to know how much the machinery could handle. When starting the machinery, the forks should be in the down position. Keep in mind that there is a loss of roughly one hundred pounds carrying capacity for every inch further away from the carriage that the load is carried. To be able to safely lift a palletized load, drive the forklift to the pallet and halt with the fork three inches away from the load. Level the mast until it is at right angles to the load. Raise the forks to one inch beneath the slot on the pallet and drive forward. Afterward lift forks four inches. Tilt back the load to secure it for moving. Drive the lift backwards if the load obscures frontal vision. Check behind and honk to warn other workers. Never allow forks to drag on the ground. The load must be loaded by the forklift in such a way that ensures the load is secure and will not create a hazard to other people or objects. Restraining loads is required for materials which may shift during transport and destabilize the forklift. Drums could be strapped together in order to prevent shifting and movement of the drums. Operators of forklifts must drive slowly when lifting liquids, to decrease instability in the forklift.